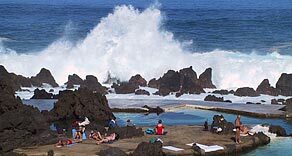 Porto Moniz pools is located north of the island. 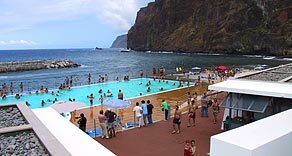 A very popular complex in an outstanding location, with great facilities, lifeguard surveillance, natural seawater volcanic pools for both Adult and children. Sometimes a bit crowded during the summer, but an excellent place for visitors to enjoy the sun and a safe swim. 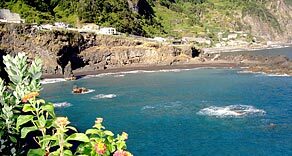 The beach of Ribeira da Janela is a charming pebble beach situated in a small village on the north coast of the Island with great views of its valley and sea. Here you may find tranquility, good water quality and great facilities such as changing rooms with handicap access, sea rescue equipment and lifeguard surveillance during the bathing season. This beach is also popular with surfers. Nearby there is parking, a campsite and great hiking trails. Praia da Laje or sometimes known as Jamaica beach, is a beach in Seixal, located north of the island, a beautiful village with an excellent black sandy beach. At the entrance you can find a long pebble beach, which is also great for swimming, fishing or scuba diving, however this is not Praia da Laje. That is located further down on a hidden bay with sand and partly with tiny pebbles, making this place unique and very peaceful. It offers good facilities such as changing rooms, outside showers and a snack bar restaurant. Lifeguard surveillance during the summer. Piscinas Naturais do Seixal is another place to choose for good quality beach. 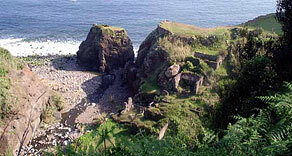 Located near Praia da Laje, access is through the old road. These natural pools offer crystal clear waters, good facilities, a bar but no lifeguard surveillance. Praia do Club Naval do Seixal is another good choice of a quality beach, located near Seixal´s harbor. A large natural pool offering good water quality, lifeguard surveillance during the summer, great facilities and excellent sea access. This location also has a black sandy beach by the harbour. São Vicente Beach consists of three beaches Praia do Calhau, Praia da Faja da areia and Baía dos Juncos. All have great water quality and are enjoyed not only by locals, but by those who visit. Located north of the island, its sea can be a bit rough but it’s quite popular with surfers for this reason. Two of these beaches were newly upgraded with a support facility for various water sport adventures. 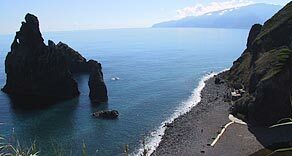 Fajã da Areia is now protected with a sea breaker making this a great place for those who enjoy a variety of sports. It also offers a sundeck with an outdoor café. Baía dos Juncos Club Naval is also another great complex, offering excellent facilities such as a gym, sauna, water sports facilities, bars and restaurants. 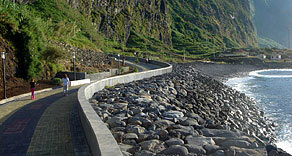 There is also a promenade, which connects to Varadouro and Baía dos Juncos. 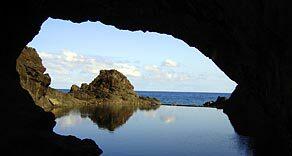 Ponta Delgada pool complex’ located north of the Island, has great views from its high cliffs. This complex has great facilities, including first aid and lifeguard surveillance, an Adult pool and a children’s pool both comprised of seawater, a snack bar and a restaurant. 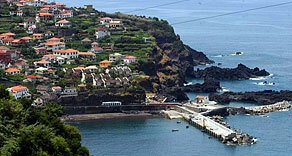 Praia da Ribeira do Porco is located in the attractive village of Boaventura. It is only accessed through estrada do Cardo. A magnificent and secluded pebble beach by the rivers mouth, where remains of an old sugar mill’s machinery can be found, this beach has no facilities and no surveillance. It does however offer great water quality for swimming and ideal place to get away from it all and enjoy a relaxing day under the sun.